Superpoly Track Pant with sublimation printing in 2.5 meter fabric quality. It is good looking , very durable , double stich , with side chain in superpoly fabric . 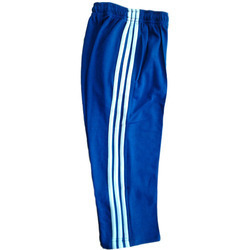 mens sports trackpants, running trackpants. With rich industry experience & knowledge, we have been able to provide the best array of Mens Sports Lower. We are an eminent firm engaged in offering quality assured array of Mens Sports Lower to our valued clients. The provided lower is well-designed by skilled professionals using the qualitative fabric and latest techniques.